There are two Lakeshore drives in Flagler County: one in northern Flagler Beach, and one at the end of the earth, so far as the county is concerned: along the southern shore of the handsome but alligator-infested, 1,900-acre Lake Diston, at the southwestern end of the county, straddling Volusia’s border. That’s where word was coming in of an experimental plane going down–in the lake. Several unites of Flagler County Fire Rescue were dispatched, as was Flagler County Fire Flight, which arrived above the lake at 7:25 p.m., only to report that it could only see debris, and the plane’s landing gear, but not much else. The plane, in fact, was upside down in the water. “No people,” the pilot said. By then Allan Burrows, 59, and Kathrine Burrows, 51, both of Port Orange, had done what would startle anyone familiar with the population of the lake: they’d swam to shore. Allan told authorities that he was attempting to land the plane on the lake but the plane’s floats were not responding correctly, according to a Florida Highway Patrol report. Allan “attempted to increase throttle in an attempt to lift off,” the report states. Instead, the left float became submerged, forcing the plane to “violently yaw” counterclockwise, and begin to sink. The Burroughs, who have 32 years’ flying experience between them, got out and swam to shore. It was not long before sunset. 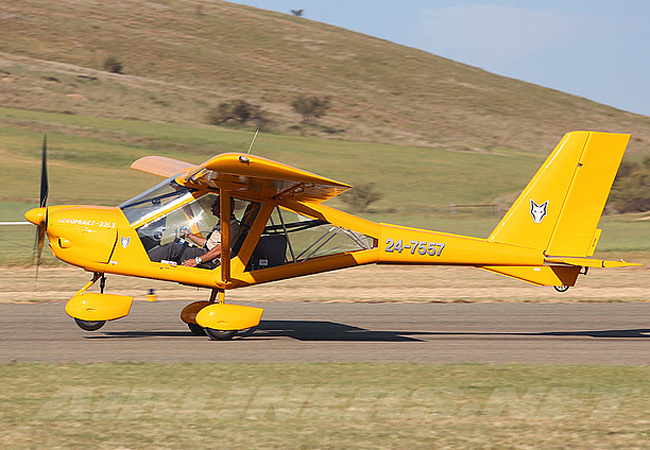 Their plane is virtually brand new: it was manufactured in 2012 by Aeroprakt America Inc, with a Rotax engine. It is registered in DeLand. Tuesday’s was the third aircraft emergency this year in Flagler, starting with the crash into a house in Palm Coast’s U-Section (on Utica Path) in on Jan. 5, that claimed the life of three people. Three weeks ago, a single-engine plane malfunctioning above Palm Coast landed safely on Palm Coast Parkway, with its instructor-pilot and student-pilot on board. So, is there a photo available of the aircraft with floats instead of or in addition to wheels? In my 20 some years in Flagler county , this is about the 18th plane or helicopter accident. I swear there is something EVIL in the air. Go ahead and laugh, but …There’s SOMETHING on the WING….SomeTHING !! !